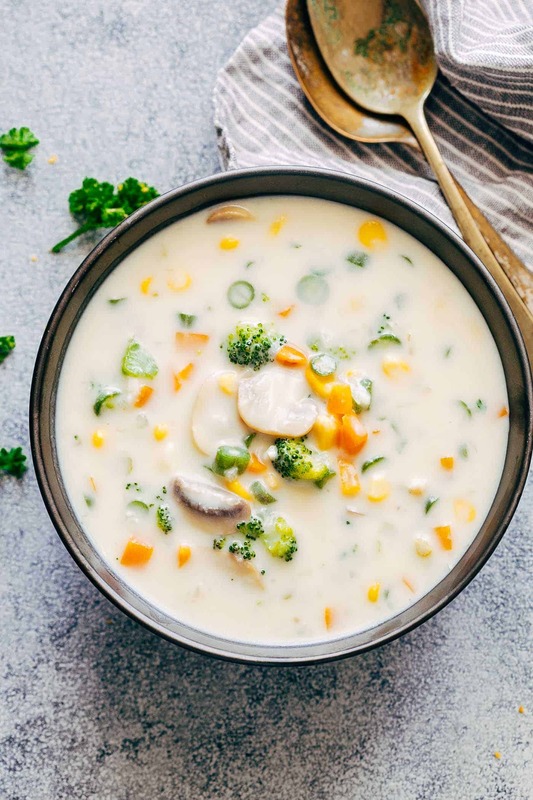 Lets talk about this creamy vegetarian soup today because it is just as delicious as any meaty chicken soup you’ve had in your life. Its the perfect blend of light and easy when you want a quick, hearty meal. This soup has old time memories. As soon as winter began, my mum would start whipping up all kinds of soups for us and this one always topped our list of requests! Its loaded with fresh winter veggies and makes every winter evening so so worth it. I’m not even kidding you when I say that I make a potful which lasts the two of us at least three days – because I want this soup ALL THE TIME. I know there are tons of ‘cream of vegetable soup’ cans out there and some of you probably grew up on that but this is the real deal guys. Its made entirely from scratch and has a velvety mouthful that’s hard to beat. Can you actually believe that there is no cream in the list of ingredients? Which is why I call this creamy vegetable soup light and easy. Its quick because vegetables cook really fast – you want them crunchy and light because all we do is create a roux with flour and milk which helps thicken the soup without piling on the calories. My favourite vegetables are celery, carrots, beans, mushrooms and broccoli but go ahead and add peas, sweet potatoes, potatoes or even cauliflower. 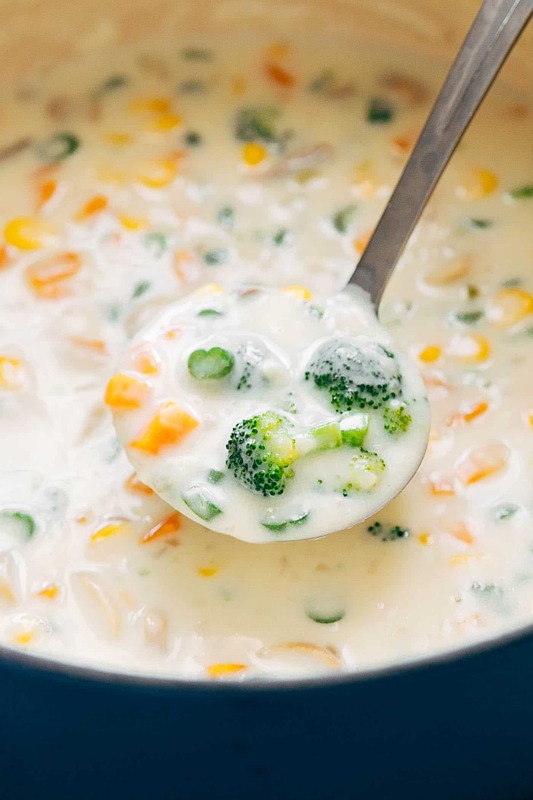 So this creamy vegetable soup can easily become ‘everything but the kitchen sink vegetable soup’. And if you absolutely absolutely want to add some meat, go ahead and add cooked shredded chicken or shrimp to this recipe and make it your very own cream of chicken soup. 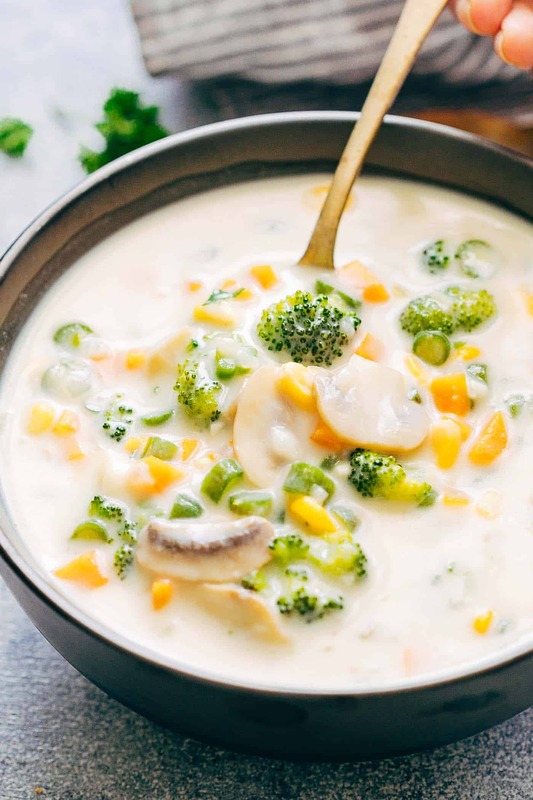 Whatever you do, make this tonight because this light and delicious creamy vegetable soup will become your favourite comfort food. I’m just over here with my bowl, slurping away for the night. Catch you in a bit!